Seaweeds are a group of diverse and ecologically important marine primary producers. There are three groups of seaweeds, namely the green (Chlorophyta), brown (Phaeophyceae), and red (Rhodophyta) seaweeds. Globally there are over 11,000 species of seaweeds known to science. Seaweeds provide food and habitat that support diverse marine food webs and many commercially important crustaceans and fishes. Giant kelp forests are formed by the largest seaweed in the world, with individuals growing over 100 feet in length. These forests are one of the most productive habitats on Earth. Diving in a giant kelp forest during my master’s research in California. Giant kelp forests, composed of the species Macrocystis pyrifera, are common off the coast of California and in other temperate areas of the globe. Photo courtesy of L. Green-Gavrielidis. In addition to their ecological importance, seaweeds are also economically important. Seaweeds that are consumed by humans are called sea vegetables and include the red seaweed nori, which is the wrapper in your sushi, and brown seaweeds known as kelp that are found in miso soup and seaweed salad. Seaweeds also produce commercially important compounds, known collectively as phycocolloids. These compounds are used in a variety of products ranging from ice cream to toothpaste. Due to the importance of seaweeds, the seaweed aquaculture industry produced 27.3 million tons of seaweeds in 2014, valued at $5.6 billion. In recent years there has been increased interest in seaweed farming in the United States and there are now sugar kelp (Saccharina latissima, shown in header image) farms throughout New England. Some scientists are especially interested in the ecosystem benefits of seaweed farming. In a paper published in 2017, Carlos Duarte and his colleagues outline four potential ways that seaweeds may help combat the effects of climate change in marine ecosystems. Seaweeds are primary producers, meaning that they use light from the sun to photosynthesize and take up nutrients, including carbon, directly from the water column to grow. Both wild and farmed seaweeds can serve as “carbon sinks” by removing carbon from the water column and storing it in their tissues. While wild seaweeds are likely to decompose in the water column, thus releasing their stored carbon, carbon stored in farmed seaweeds is removed when they are harvested. Most seaweed aquaculture currently occurs in coastal waters using simple equipment that cannot withstand significant wave action. The current ability of seaweed aquaculture to expand is limited by the amount of suitable coastal locations and competing activities (e.g. wild fisheries, recreation). Since seaweed aquaculture currently occupies a limited space, its potential to remove oceanic carbon is quite small, with an upper limit of carbon extraction calculated to be 2.48 million tons of carbon dioxide. While this sounds like a large amount, it represents only 0.4% of the extraction that occurs by wild seaweeds. Expansion of seaweed aquaculture into off-shore waters could increase the potential of farmed seaweed to serve as a carbon sink, but first we need to invest in research and development into off-shore infrastructure. 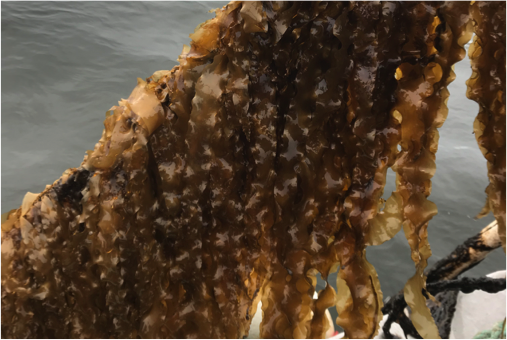 In the U.S., several projects including one in New England were recently funded to pursue off-shore seaweed aquaculture. A Kappaphycus farm in Bali, Indonesia. This seaweed is used for the phycocolloid carrageenan that is used as a gelling agent in food products. Photo courtesy of L. Green-Gavrielidis. Agriculture currently produces 30% of global greenhouse gas emissions. Seaweeds have the potential to reduce agricultural emissions by increasing soil quality and reducing the release of greenhouse gases from livestock production. Seaweeds have long been used as soil fertilizers or compost that can improve the organic content of the soil, thus improving soil quality and reducing the need for industrial fertilizers. The production and application of industrial fertilizers are a significant source of greenhouse gas emissions from agriculture. Seaweeds are also used as supplements in livestock production since they provide a source of essential minerals. A study published in 2016 reported that seaweed had the potential to decrease production of methane, a potent greenhouse gas, by cattle. However, this experiment was conducted in a laboratory setting and the results require further verification. Even so, seaweeds have the potential to decrease emissions from agriculture and livestock production. Coastal erosion is the eroding of coastal beaches and properties as a result of storm surge and sea level rise. Canopies of wild and farmed seaweeds can reduce wave energy and help protect coastal environments from the impacts of erosion. Farmed seaweeds, unlike their wild counterparts, are suspended in the water column close to the surface. Therefore, the degree to which a seaweed farm will dampen waves will depend on its orientation and the local water currents and wave action. As atmospheric carbon dioxide increases, the ocean absorbs more and more carbon, which results in a decrease in the pH of the ocean; this process is known as ocean acidification. Ocean acidification can make it hard for organism such as mussels, oysters, and corals to build shells. Seaweeds naturally increase the local pH during the daytime because they are removing carbon from the water column as they photosynthesize. Depending on the water flow in the region, seaweeds can potentially provide an area of high pH during the daytime that is beneficial for species with shells. It is important to note, however, that the effect of seaweeds on pH may not occur during the night when seaweeds are releasing carbon dioxide through respiration. Also, many farms are seasonal, which means that the benefits of farmed seaweeds on ocean acidification end when the crop is harvested. Even so, many states including Washington and Maine are investing in research on how seaweeds can benefit commercially important shellfish that are threatened by ocean acidification. A sugar kelp longline in Narragansett Bay, Rhode Island. Sugar kelp farming has been increasing across New England. Photo courtesy of L. Green-Gavrielidis. Seaweeds provide many services and are an essential component of our coastal communities. Seaweed aquaculture has the potential to locally reduce the negative impacts of climate change through carbon uptake, reduction of agricultural greenhouse gas emissions, and protection of shores from coastal erosion. These positive effects will depend on local environments and the local use of the seaweeds being farmed (e.g. sea vegetable, commercial compounds, livestock supplement). Seaweed aquaculture also provides sustainable, healthy seafood for local communities. As the seaweed aquaculture industry expands, additional research will help us to discover the full range of benefits of farming seaweeds. ← Why was it so hot during the years 2014-2016?